On an infrequent visit to my old hometown, I visited the museum yesterday to soak up some of the great Curnoe works that inspired me when I was growing up here. It was my first visit to this museum, so I was quite excited to take it all in. The first piece that greeted me, however, was extremely disappointing. It was that long fabric that stretched across the main floor north wall which is, I suppose, meant to be some tribute to Greg Curnoe – or rather, Curnoe as seen in the eyes of some visiting youth – I don’t know, but I found it enormously offensive. I am a bit of a contemporary of Greg. We both took classes from and kind of rebelled against Herb Ariss and Burt Kloezman down at the now-long-gone London School of Art, upstairs to a paint store across from the Armories. I remember him well there and at Beal, and later on in life in Jack Chambers’ studio, and at Rudolph Bikkers’ Editions Canada Studio. I admire Greg’s work very much for the thrust of color and in-your-face text. The pieces in the Curnoe exhibition are from a time before home computers and gameboys and internet, before even color TV. Why then do the insolent rantings and foul-mouthed opinions of millennium schoolchildren rate enshrining in this way? Greg would have said that they are irrelevant and gone on his way. They are irrelevant! They are worthless and insolent commentary on a subject these children cannot hope by their age and experience to understand, and they do not deserve to be displayed! Greg Curnoe would not have used a method like this to criticize his predecessors in painting. Yes, engage in debate about how this one or that one was irrelevant to his own vision, but this language, this method? Never! His script, his descriptions, his criticism is there for all the world to read, on his paintings!This attempt to emulate same with this Bayeux Tapestry of garbage commentary is a disgrace. Take it down! It is not art, it is not worthy commentary. It is just an offense to the gallery, the city of London, and to one of the giants in art in London who helped us see our part of the world with new eyes. Take it down, please. 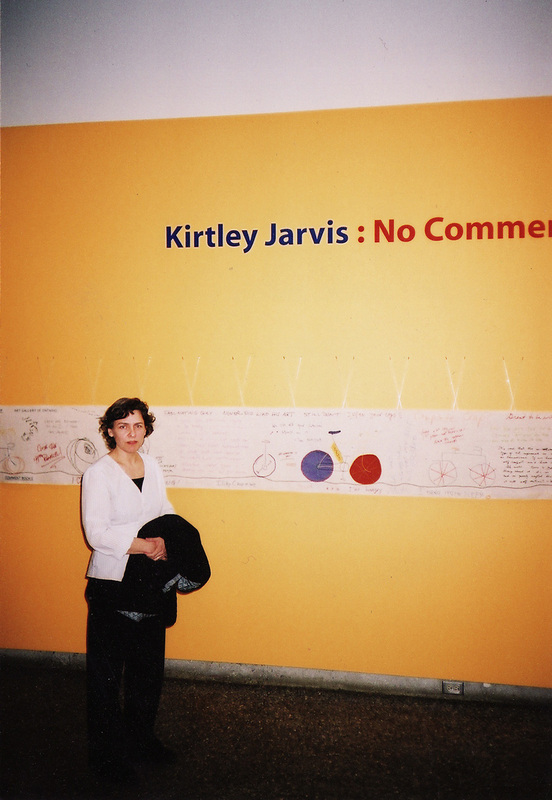 Thank you for taking the time to describe your response to the work, No Comment, by Kirtley Jarvis. Your disagreement with many of the comments that are reproduced in the work (from the 2001 public Comment Books at the Art Gallery of Ontario) is understandable, given that many of them are dismissive and ill-informed. That, unfortunately, is the nature of much public response to contemporary art. It is often the role of art to reflect aspects of reality back to us, including unpleasant ones. I do not conclude that because Ms. Jarvis has reproduced the comments that she endorses them. In fact, both Ms. Jarvis and Ross Woodman, the essayist for the accompanying brochure, were friends and colleagues of Greg Curnoe and Ms Jarvis had the close cooperation of Sheila Curnoe, the artist’s widow, in producing the work. I understand No Comment to be neither a criticism of nor a tribute to Greg Curnoe, but an occasion for reflection on the nature of public response, particularly that found in comment books. The act of writing in comment books often happens in a kind of vacuum, with no indication whether anyone will actually read or consider what one writes. I find it interesting, however, that several of the comment book writers have, in fact, criticized their fellow writers for recording thoughtless and facile comments. For me, No Comment challenges the viewer to imagine a genuine and informed public discussion about contemporary art, one in which one’s words will be read and perhaps challenged. We appreciate the thought you put into your response to the work and hope you will find future visits to Museum London rewarding and stimulating.